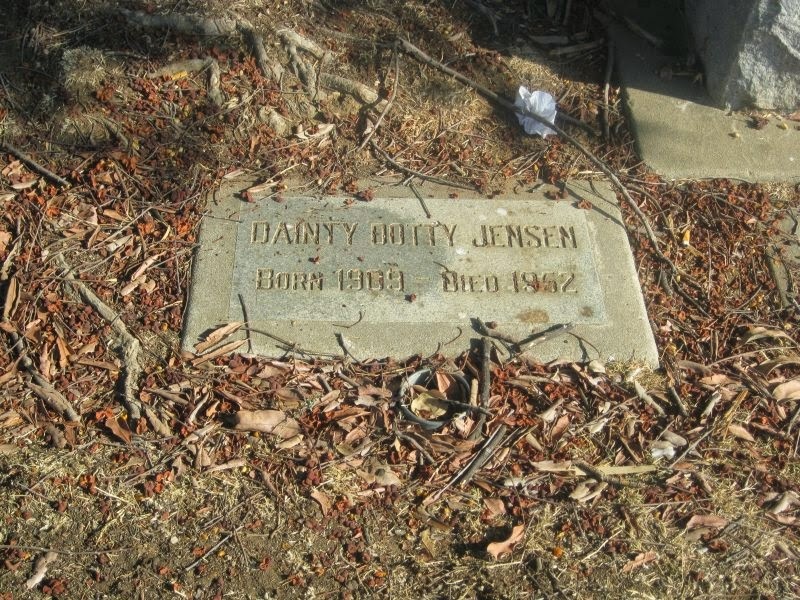 “Dainty” Dotty Jensen’s grave is located at the left corner of the Ladies Auxiliary Pacific Coast Showmen’s Association marker in Los Angeles’ Evergreen Memorial Park and Crematory. 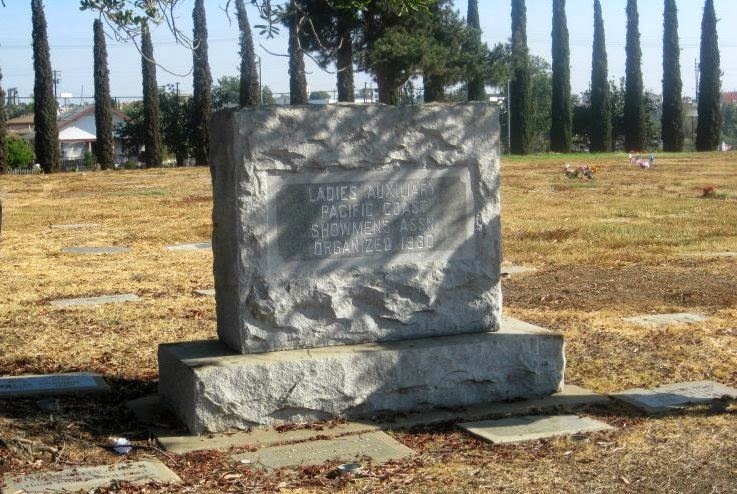 Her remains are among those of over 400 carnival employees and performers in the Showmen’s Rest portion of the cemetery. Frustratingly, I wasn’t able to find out very much about Dotty (whose first name was most likely Dorothy) despite her somewhat public career as a circus performer/attraction. There were a few pieces of the puzzle that came together, particularly after her marriage to tattoo artist Owen Jensen, but there are many details of Dotty’s narrative that remain a mystery. The earliest information pinning Dotty down to a specific location is from December 28, 1931 with the birth of her son Richard Nathan Strindberg in Illinois. By the time Richard was 8 years old he was a ward of the state at the Illinois Children’s Home And Aid Society. The circumstances of his status as an orphan are unclear, but at some point prior to Dotty’s death in 1952 the two had been reunited. Because there was no father listed, I thought that maybe Dotty’s maiden name was Strindberg. An exhaustive search in that direction resulted in another dead end, but I still might’ve been onto something. Based on one of Dotty’s obituaries, she worked the carnival circuit for around twenty-five years meaning she entered circus life around 18. Sometime between the 1930s and the early 1940s Dotty was part of an attraction for the Ringling Bros. Circus with Major Mite, “The World’s Smallest Man.” (As an aside, Major Mite also appeared as a munchkin in “The Wizard of Oz”.) At the height of her career Dotty weighed 585 pounds, which was excellent for her livelihood as a circus “fat lady” but being obese no doubt wreaked havoc on her health. From the Billboard‘s April 1, 1944 issue: “Dainty Dotty, fat girl with the Ringling Show in 1942, will be at Eastwood Garden, Detroit, for the season in the Palace of Wonders Museum.” By November 1944 that same publication reported that Dotty was a tattooist at Detroit’s Archie’s Playland Arcade. In late 1945 Dainty Dotty married Owen Jensen, also a tattoo artist, in Reno, Nevada. After the wedding the couple moved to Los Angeles where the two earned a living decorating human skin together. In 1946 she had an operation which may or may not have been related to weight loss.By August 1949 she’d “slimmed down” to 350 pounds when her son Owen Jensen, Jr. was born via Caesarian section. She maintained this weight until death visited in the form of a heart attack on December 17, 1952. Dainty Dotty was 43 years old when she shuffled off this mortal coil. One obituary listed that she was survived by her husband, two sons, and a daughter, but I never found evidence of the female child. The Speed Boys blog has a number of photos of Owen and Dotty that you might be interested in viewing here, including tattoo flash and images of Dotty at work. St. Petersburg Times, Dec. 20, 1952: “One of show world’s most colorful and beloved figures, Mrs. Owen (Dainty Dotty) Jensen, the fat lady of Ringling Brothers circus fame, is dead. The big top star, who infectious laughter shook her 585 pounds to the delight of thousands, died almost unnoticed Wednesday at the age of 43. Dotty, whose tenure in show business covered a quarter of a century, weighed only 350 pounds when death overtook her.